Atotech is one of the world’s leading manufacturers of specialty chemicals and equipment for the printed circuit board, IC-substrate and semiconductor industries, as well as for the decorative and functional surface finishing industries. As touchscreens become higher in demand and traditional build-up technology based on vapor deposited Indium Tin Oxide (ITO) reach its limitations, the new metal mesh technology to produce the sensor grid for advanced touch screens and sensors finds its momentum. 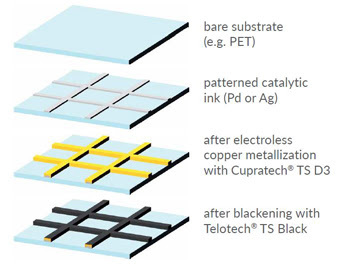 While ITO has a low conductivity and is a brittle material, copper meshes feature a low resistance – ideal for use in large displays – coupled with the mechanical properties required for flexible or curved touch screens. Visitors to the Eurodisplay 2017 are invited to learn more about this novel, additive and ITO free process for the formation of metal mesh and TFT electrodes. Eurodisplay will be held from October 31 to November 2, 2017, in Berlin, Germany and discusses the latest development in all types of displays, electronics, and their impact on society.